MGVs are required to complete a minimum of 24 hours of volunteer service in one or more locally approved projects annually and a minimum of 10 hours of continuing education after the first year in order to be certified. Keeping a record of your hours and turning them in by the deadline each year is very important. Not only do these records allow for recognition of volunteers for their hard work, but they are also invaluable for program evaluation.This provides a record of the many ways MGVs serve the public. Local and state governments, which fund the program, are very interested in how effectively UW-Extension uses tax revenues. Consequently detailed records benefit both the MG Program and its clients. If possible, record your volunteer and/or continuing education activities when you complete them. If you wait until the end of the year to write this down, you may forget how much time you really spent on projects and underestimate your contributions (or just decide it’s too much trouble and get no credit for your hard work). The deadline for submitting hours is October 1 of every year (or earlier in some counties). Turn your reports in by the deadline to your designated County Coordinator. We are currently in the process of implementing an online recording system (ORS). We want MGVs to enroll in that now (fall of 2018), and the ability to record hours should become operational in early 2019. Anyone who has completed the CBC should be in the system now. If you think you should be in, but can’t find your name, send us a message. [Update Feb 2019] Coordinators may now access the ORS to view individuals in their county. 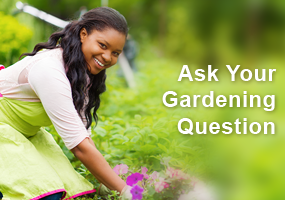 The site is accessible at https://volunteers.wimastergardener.org/vms/sec_Login/. 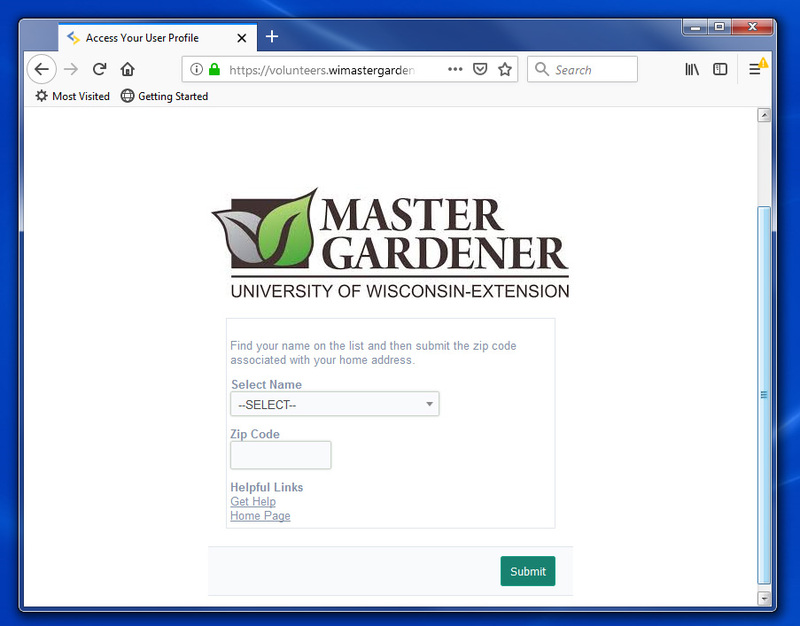 You can access your records through the portal at https://volunteers.wimastergardener.org/vms/mg_access_form/. You first need to select your name from the list. Just start typing in your first or last name (whichever is most distinctive will get you there fastest) and it will automatically filter through all the names to bring up those with a partial or full match. If you type in your full first and last name you will NOT see your name, so use just one or the other! Once you see your name in the drop down menu, click on it. Once you get to your record you can see what information we have on file for you. From now on YOU get to update this yourself rather than contacting us to do it. In order to save any changes you MUST create a username and password. Then there are several agreements that you have to read and agree to. We’ve had you do the Volunteer Expectations Agreement on paper before – now it’s just a checkbox (but the same text as the paper form). There are also some new things to agree to that are required by UW-Extension that anyone who has been a 4-H volunteer should be familiar with: sections on Assumption of Risk, Hold Harmless clause, and Consent for Emergency Treatment. This must be accepted to be a certified volunteer. There is also a Photo Release which you do not have to accept, but you have to provide an answer. Once those are all checked, click on the green box that says “Save Profile” (on the right side at both top and bottom) and you’re done for now! This is the first phase of the system. You CANNOT enter hours at this point in time! Use your normal paper or Excel file timesheet until the ORS is fully functional! Timesheets are a method to keep track of the hours you volunteer as a MGV. They may be kept on paper or electronically. The MG Program Office offers a standard timesheet, but not all counties use this. Check with your county to be sure you are using their preferred form! If you are unable to complete the minimum number of hours for recertification, you can complete a one year exemption request form and submit it to your local county in order to receive MG Program Office communications for the following year. It is expected you will resume normal participation and submit hours the following year. All other requirements (including the CBC and MRT) must be met to be eligible. If you have been away from the program and want to resume as a volunteer, see “Time Off” under Policies. Guidelines and suggestions for activities that qualify for volunteer hours are outlined on the last page of the standard timesheet. However, the County Coordinator is the final authority on determining what is acceptable. A general rule of thumb is that the activity benefits the community (not just an individual). 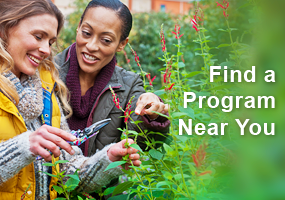 Contact your local county UW-Extension office BEFORE you embark on a project to make sure it is OK as volunteer service! Travel time based on the time a MGV leaves home until returning home, minus personal errands, and preparation and research time can be included in volunteer service hours. (Travel time to CE programs cannot be counted.) See Volunteer Projects for more information. 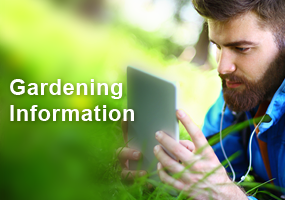 Continuing education (CE or professional development) is a way for MGVs to learn more after Level 1 training and keep up with the latest horticultural information. Policies on what counts as CE vary by area. Check with your County Coordinator (usually the county UW-Extension agent) to be sure of what is acceptable in your county.